Beginning on Christmas Day in 1900, the Audubon Society has been sponsoring Christmas Bird Counts (CBC’s) to help monitor the health and status of bird populations throughout North America. In that first year, there were 25 count circles with a total of 27 birders. 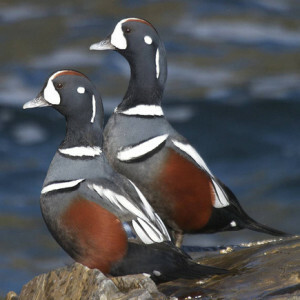 Now, there are over 2300 count circles each year with over 70,000 birders participating, with the locations stretching from Alaska to South America. 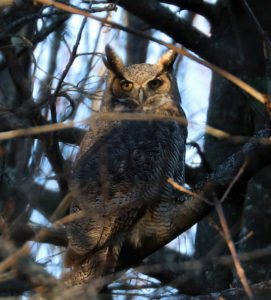 Each year, York County Audubon sponsors two counts. The Southern York County circle extends from Kittery to Ogunquit, while the Biddeford/Kennebunkport count circle reaches from Kennebunk to Saco. Each count territory is a geographic circle, carved out into six or more territories. Each territory has a team that scours it during “count day” looking for all bird species, and recording the numbers seen of each. It can, at times, be a bit more art than science, as we attempt to count – but not double count – the birds we find. We also have supporters who monitor their home feeders during the day and contribute their totals. To avoid double counting, we ask them only to report the greatest number of each species that they see at any one time during the day. At the end of the day (at 5 p.m.), we meet to compile the counts and share highlights. Once compiled, the counts are forwarded to National Audubon for their master compilation. Both locally and nationally, the totals are reviewed to assess trends in the populations of all species. While the totals can vary fairly dramatically year to year due to the weather that happens to grace us on count day, the bigger picture over time can be very informative. This year, the Southern York County CBC will be held on Monday, December 17th, while the Biddeford/Kennebunkport CBC will be on Saturday, December 29th. The Southern YC compilation will be held in the Mather Auditorium at the Wells Reserve, while the Bidd/Kport compilation will held at the Church on the Cape in Cape Porpoise. If you might like to find out about participating in one or both, please contact Monica Grabin at 207-985-3342 or grabin@roadrunner.com for the Southern York County CBC, or Kathy Donahue at 207-967-4102 or kadona11@roadrunner.com for the Biddeford/Kennebunkport CBC.